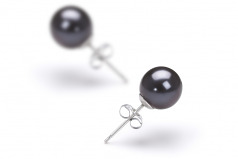 Dyed Black, these flawless freshwater pearls set the formal attire required world ablaze every time you step out wearing them. Larger than the ordinary size, they are clearly visible and equally tantalizing when paired with like colours or fashion met sense. 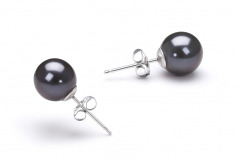 The earring set features elegant stud and a lifelong guarantee. Designed by you and left to others a life time last well beyond just us. 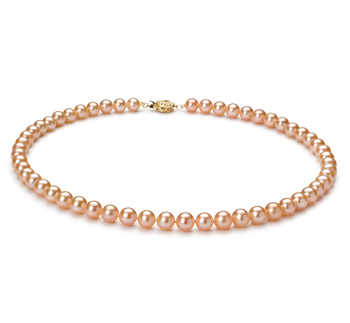 The (AAAA) overall picture-perfect lustre creates a glowing image of natural beauty and fashionable luminosity that other grades may fall short on. 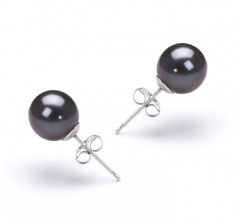 You create the look, style and desired outfit and let the Black 7-8mm AAAA Quality Freshwater Pearl Earring Set bring it to life. That is the Black Label Collection ~ Pure Indulgence and Ultimate Luxury.